People can't stop talking about this top rated 2019 Toyota 4Runner Limited Nightshade. ALL-WEATHER FLOOR LINERS/CARGO TRAY PACKAGE , NIGHTSHADE EDITION, KEEP IT WILD SAVINGS, DOOR EDGE GUARDS, COIN HOLDER/ASHTRAY CUP, Window Grid Diversity Antenna, Wheels: 20" Black Alloy -inc: wheel installation kit, Variable Intermittent Wipers w/Heated Wiper Park, Valet Function, Trip Computer. 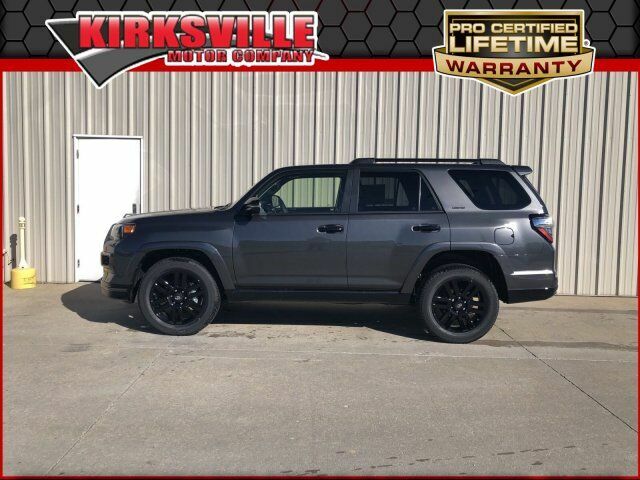 A short visit to Kirksville Motor Company located at 3607 N Baltimore St, Kirksville, MO 63501 can get you a dependable 4Runner today!